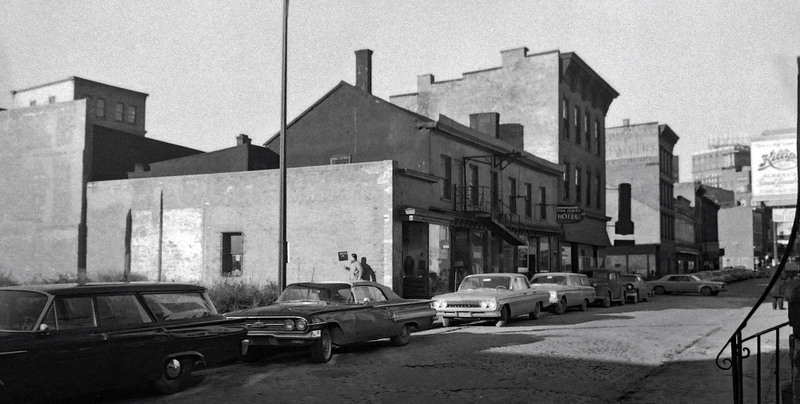 75 and 73 Green Street, December 1962. NYS Archives. 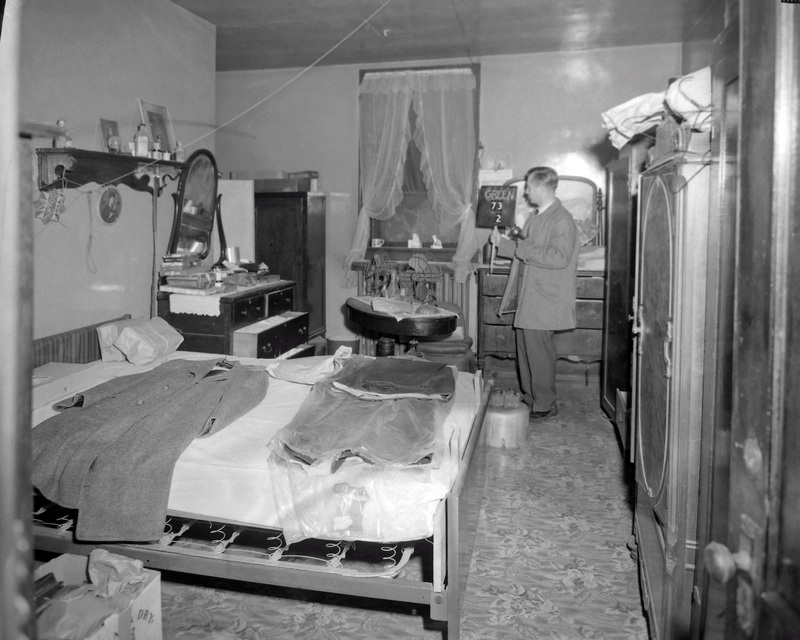 On April 8, 1940, census enumerator Anthony Leone found 92 men living at the Palombi Hotel on Green Street. White, marginally employed, and predominantly native-born, they ranged in age from 28 to 76. They probably paid a quarter a night for a bed, more for a private or semi-private room. 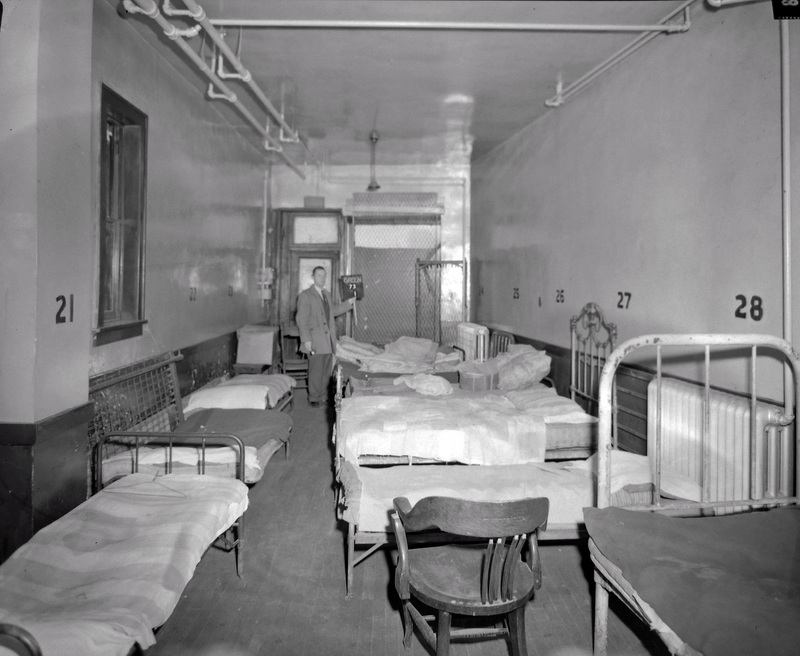 Census enumerators in 1940 counted 92 residents; many slept on numbered cots. NYS Archives. Transient or semi-transient, these men are difficult to track. Their names don’t show up in the city directory. Most are not listed in the register of voters. Few, if any, friends or loved ones remember them. Complicating matters, the manuscript census for 1950 and 1960 will not be open to researchers until 2020 and 2030, respectively. That leaves local newspapers. Some Palombi residents did make news—none of it good. The address, 73 Green Street, was associated with all manner of crime—assault, manslaughter, petty theft. One resident was caught trying to shoplift 11 pairs of socks from Kresge’s. Another was accused of stealing cash from a woman’s purse during services at Our Lady of Angels Roman Catholic Church. A semi-private room. NYS Archives. The hotel witnessed more than its fair share of death. One hotel employee burned to death in a pile of rubbish. Other men died suddenly of natural causes. At least resident one committed suicide, jumping into the Hudson River from the Dayliner Pier. But perhaps the most famous of these deaths was fictional. In William Kennedy’s Ironweed—early drafts of which are set in 1960s Albany—the character Helen Archer dies in a private room at the thinly veiled Palombo’s Hotel. 73 Green Street was not simply a place to sleep and die. It was also a place to drink. While local clergy deplored the city’s “drunk derelict problem,” intoxicated men and women danced and kissed and fought and fell down at the bar of the Palombi Grill. 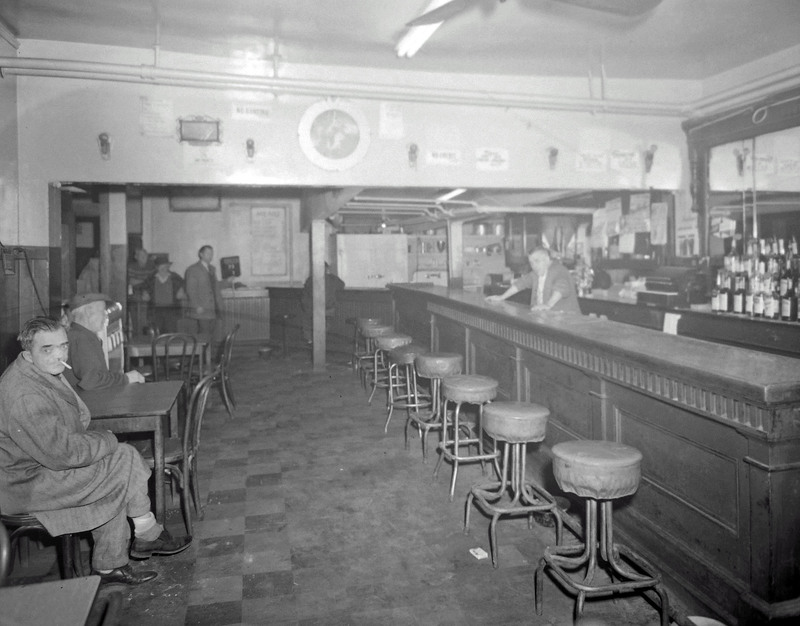 Occasionally, the State Liquor Authority would suspend the Palombis’ license for “selling liquor to an intoxicated person,” “permitting disorderly conversation and deportment,” or “permitting … intoxicated persons to sleep on the tables.” But after 30, 40, or 60 days, the bar would be back in business as before. The bar at the Palombi Grill. NYS Archives. That business could be rough. In 1951, a bar fight sent four people to the hospital, three with knife wounds to the hands and face. The fourth, bartender Nicholas Monaco, suffered a fractured ankle while trying to break up the fight. The instigator was a hotel resident. In 1963, the arrests and Liquor Authority citations stopped. The Palombi Hotel and Restaurant was demolished to make way for the South Mall Arterial. Its former residents probably took shelter in other cheap hotels, or perhaps abandoned buildings, but both of those alternatives were quickly disappearing. A rare private room. NYS Archives. This is a great story. Is the photo of 75 and 73 Green Street copyrighted? I am an artist and sometimes like to paint in black and white. The photographs (actually Photoshopped negatives photographed on a lightbox) are in the public domain. The negatives are in the collection of the NYS Archives. Feel free to use the images we posted. If you’re interested, we are also happy to help you find the originals. Perhaps you should run a caption contest: what is going through that bureaucrat’s mind in each room? Is he ashamed? Is he revolted? Is he muttering to himself about one false move and I live here? Or, I remember visiting my uncle in a place like this? He really changes our experience of the pictures. Can you find him to interview? A caption contest is a great idea, and you’re right, it would be even better to talk to the man himself. We believe he was an employee of the NYS Department of Public Works, Bureau of Rights of Way and Claims, but we don’t know his name–yet. Apparently also, Green Street was known for its prostitution population. Police records might confirm this statement. My mother was a nurse and my dad worked for the telephone company, living in the suburbs in the suburbs in the 50s and 60s. In 1960 Dad contracted tuberculosis which nearly killed him. It was said that the disease was from installing phone service in the “98 acre” area. Was this perhaps part of the health picture of the area at this time? I am trying to shed light on the era, not point blame after all these years. Dad lived to the age of 83. Yes, it is possible that your father contracted tb while working in the area. 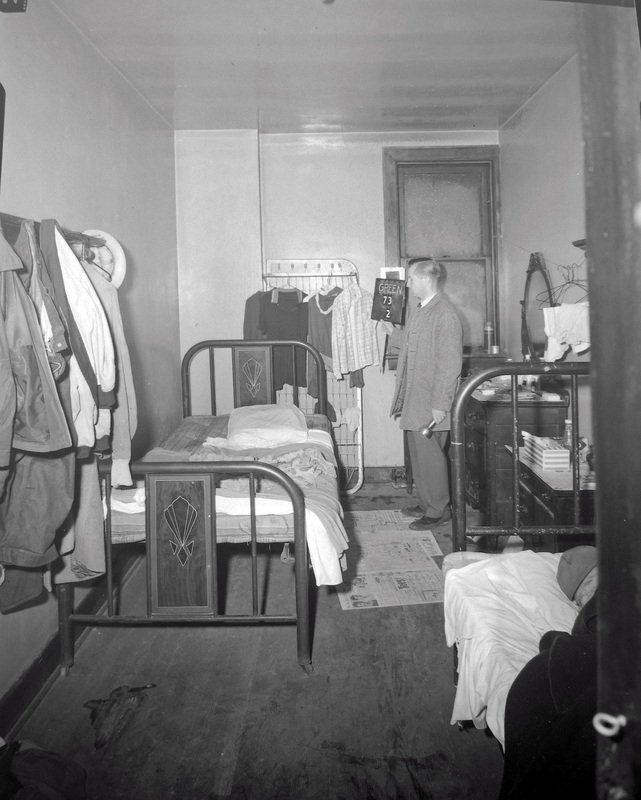 County health statistics and other records reveal a high rate of tb in the South End generally but particularly among single men, many of whom lived in the SRO hotels or rooming houses clustered within and near the 98 acres.